At Columbia City Optometry we aim to make vision therapy affordable and convenient. A well-designed computer-based approach is used, which reduces in-office training time and decreases the cost to the patient. Realistic goals are discussed before initiating any therapy course so that parents and patients understand the purpose of therapy. 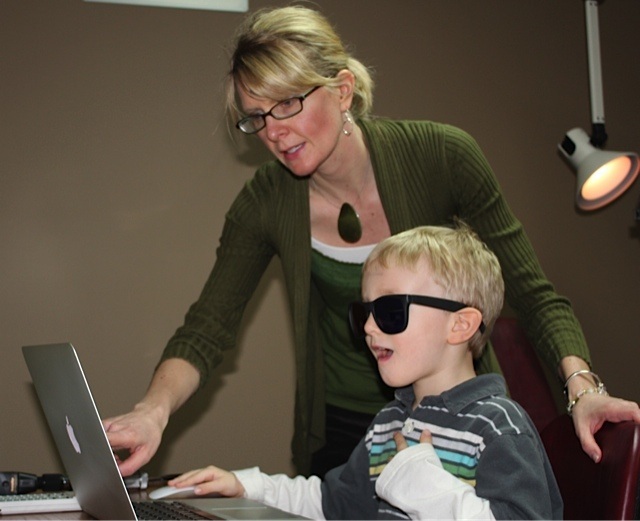 Vision Therapy is an individualized treatment program using specialized eye exercises and equipment that help teach the patient how to use their eyes correctly. My child sees 20/20. Why does he need vision therapy? Researches estimate that 1 out of 4 children have an undiagnosed vision problem that affects their ability to read and learn. It is important for parents to understand that 20/20 vision does not mean that a child has developed the critical visual skills that allow for comfortable reading. In cases where a screening or routine exam has indicated that your child's vision is good, but your child has headaches during or after school several days a week, struggles with reading or comprehension and is frustrated with school, it is important to be aware that there could be an undiagnosed eye teaming issue. We know the child focuses with his/her eyes, but do they work together in a comfortable manner that allows for success in school? Children are not the only ones who struggle with eye teaming and coordination problems. Often times patients who perform several hours of near work on the computer or have to focus up close for long periods throughout the day may also manifest symptoms of eyestrain. Again they may measure 20/20 without glasses but further testing may reveal that the person uses more effort than is comfortable to maintain clear vision. Vision therapy may be recommendde for these patients as well. The first step to determining whether or not vision therapy is needed is to schedule a binocular vision evaluation. Many factors are taken into account before prescribing vision therapy. Some patients may show poor eye teaming during an evaluation, but exhibit no symptoms. In these cases, we recommend a "watch and wait" approach. Those patients who show poor visual skills and have symptoms that are commonly associated with these conditions are most likely to benefit from vision therapy. Each person's therapy program is individualized to their specific needs and will vary in length of time needed to successfully complete a vision therapy course.